Dettori will be absent when Cracksman lines up in Saturday's Irish Derby at the Curragh. Jockey Frankie Dettori is set to be out injured until the week of Newmarket's July Festival at the earliest. The 46-year-old Italian missed Royal Ascot after injuring his arm in a paddock fall at Great Yarmouth on 13 June. He missed five winners at Ascot, including Big Orange in the Gold Cup. 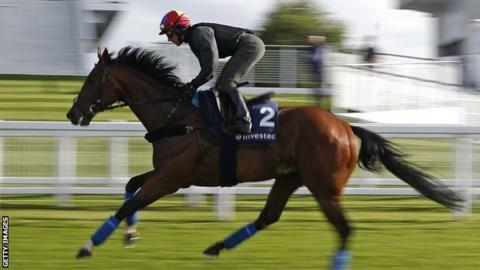 Dettori will now be absent when Cracksman, on whom he was third in the Epsom Derby, lines up in Saturday's Irish Derby at the Curragh. He will also miss the Coral-Eclipse meeting at Sandown the following weekend. Newmarket's July Festival takes place from 13-15 July.